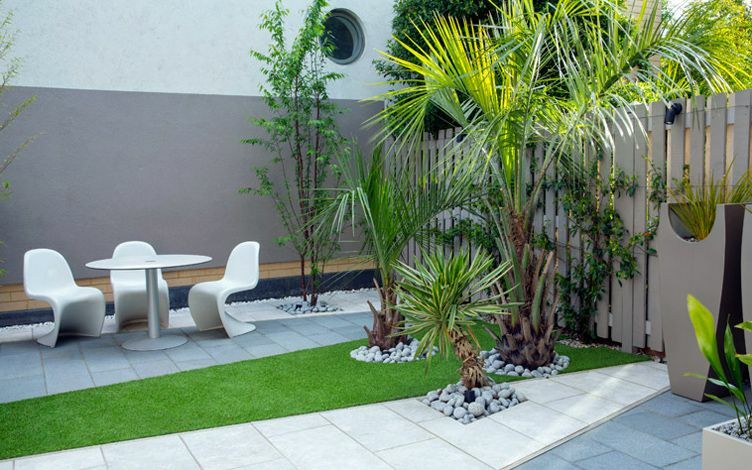 This small Highbury garden contained useful trees and shrubs which we sought to conserve; it's a cosmopolitan array of Bamboos, Palms and Yuccas – fitting for an urban location. 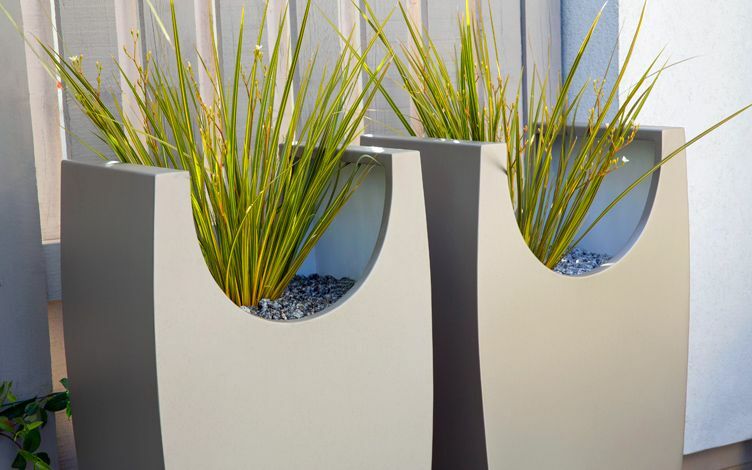 We enhanced the existing flora palette with Bar room plants, Star jasmine, Tibetan Cherry and architectural Libertia grasses in bespoke planters. 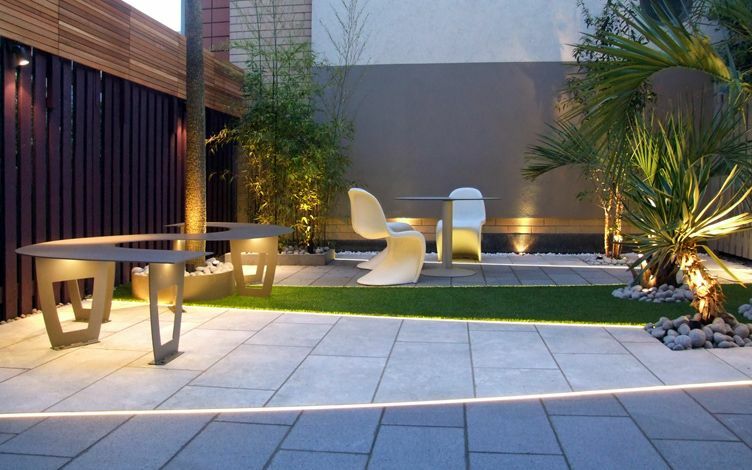 The linear design composition of contrasting limestone and granite, interspersed by synthetic grass, produces a contemporary, low maintenance outlook. 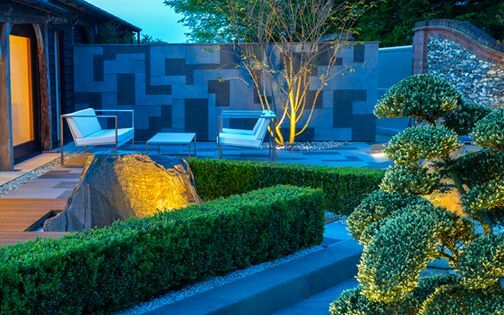 At nightfall, LED lighting redefines the garden's outline into an eye-catching, visually opulent showpiece for a cutting-edge residence. 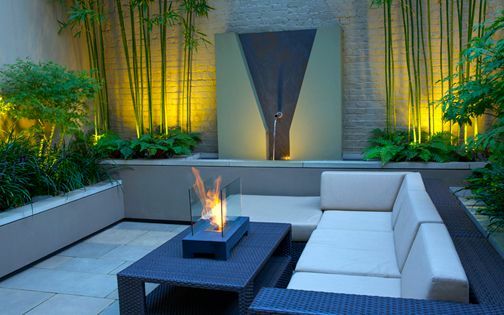 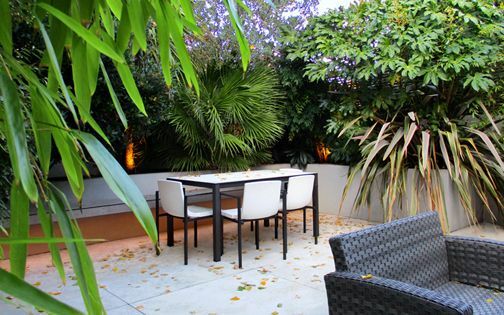 Our clients, who both work in the city, sought an outdoor room to entertain guests and a state-of-the-art garden design to complement a cutting-edge interior. 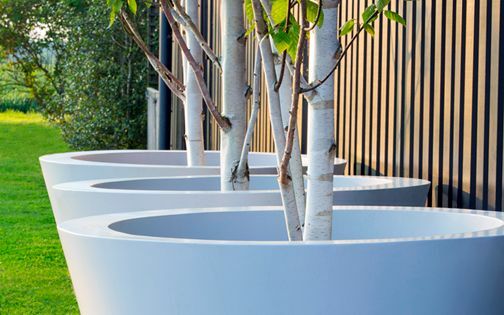 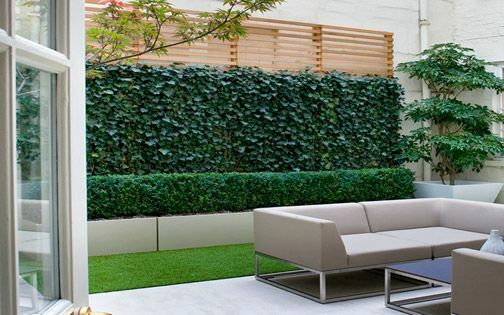 A minimalist approach was central in adapting a previous design into a liveable garden, augmenting the home's Mid-century Modern furniture and futuristic art collection. 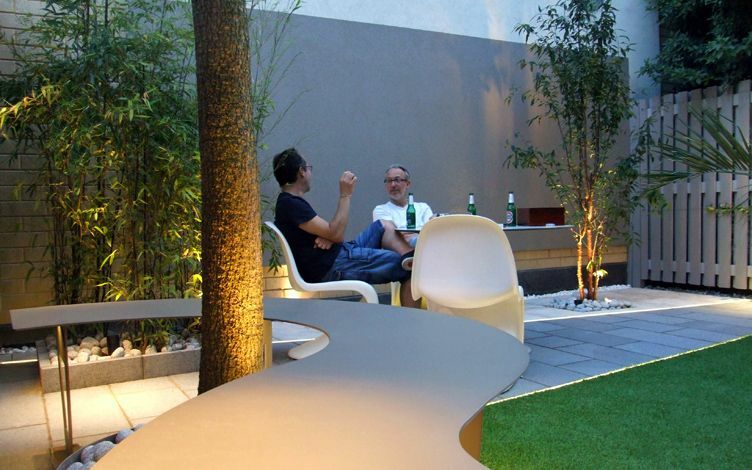 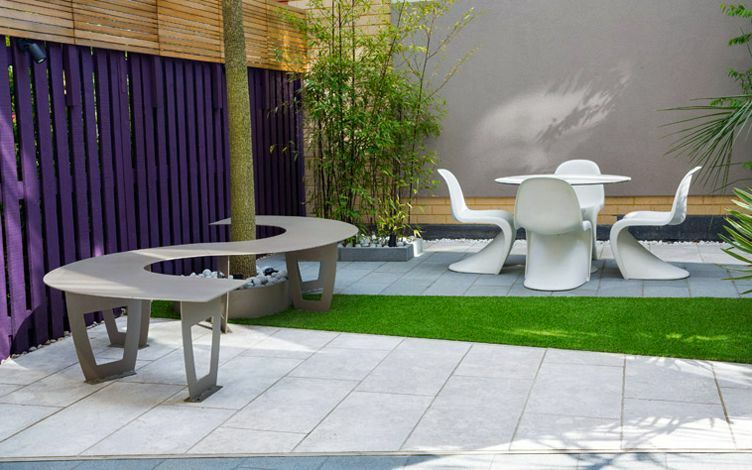 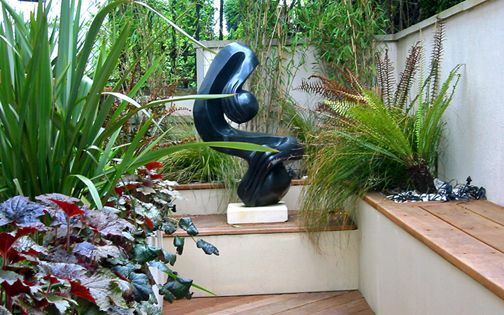 Designing small contemporary London gardens involves numerous logistic constraints and space limitations which require easy-care, long-term solutions. 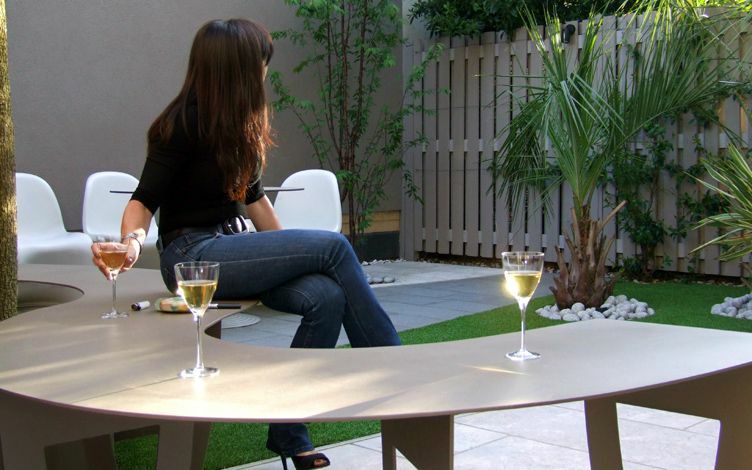 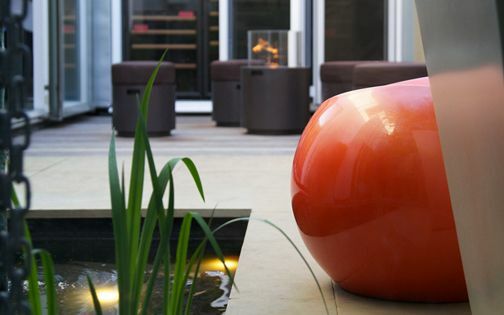 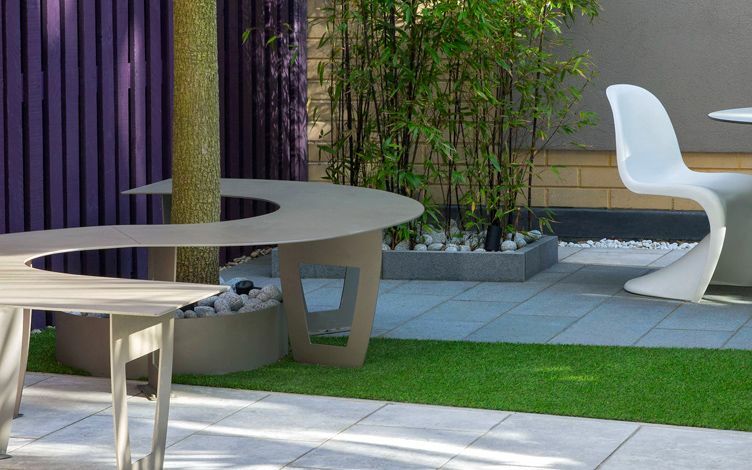 Low maintenance garden design has evolved into a cardinal lifestyle prerequisite – defining an inherent attribute of both contemporary design and ecological necessity, where outdoor living is effortlessly manageable behind the scenes, yet lastingly alluring! 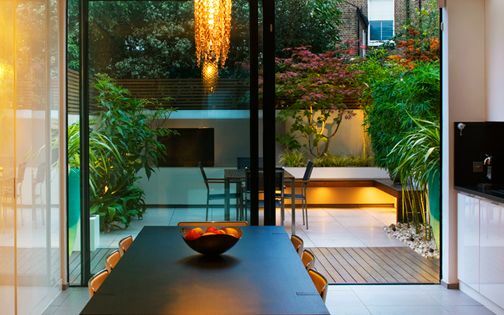 The existing mature vegetation provided a valuable architectural backdrop and substantial scale to otherwise a lacklustre Highbury garden. 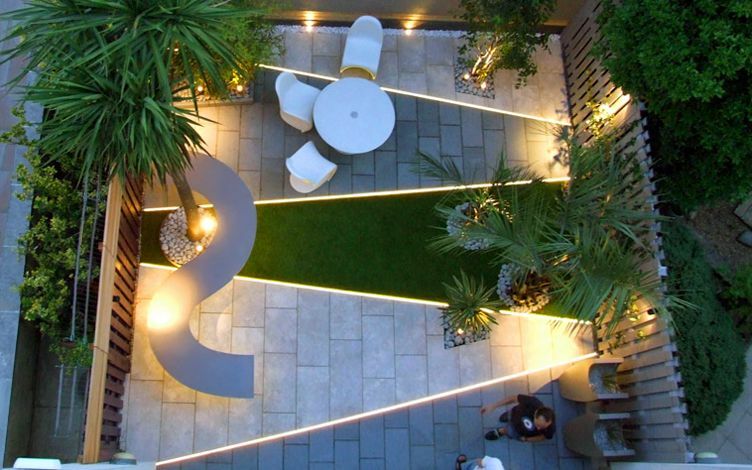 We retained all of the plants, and designed a diagonal layout which articulates a fluid continuum, conserving its antecedent setting and rejuvenating it with a dynamic blueprint. 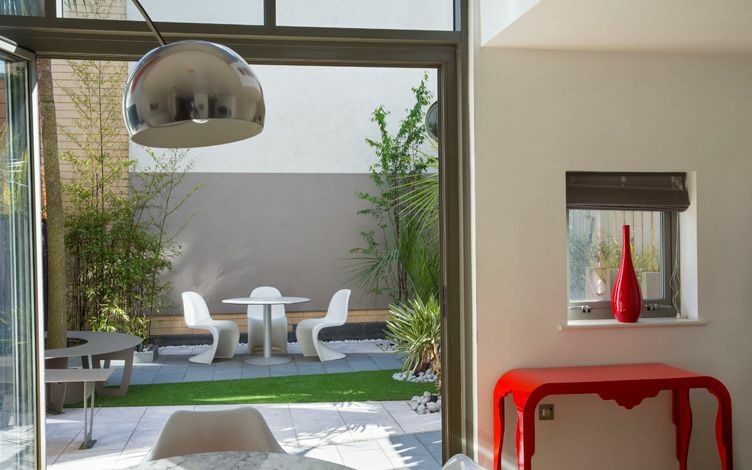 This small contemporary garden forms an integral, captivating design element of the family's North London townhouse, where its entire perimeter is viewed from both kitchen and upper levels, with a vibrant floor pattern, pivotally enhancing focus towards an engaging small garden space. 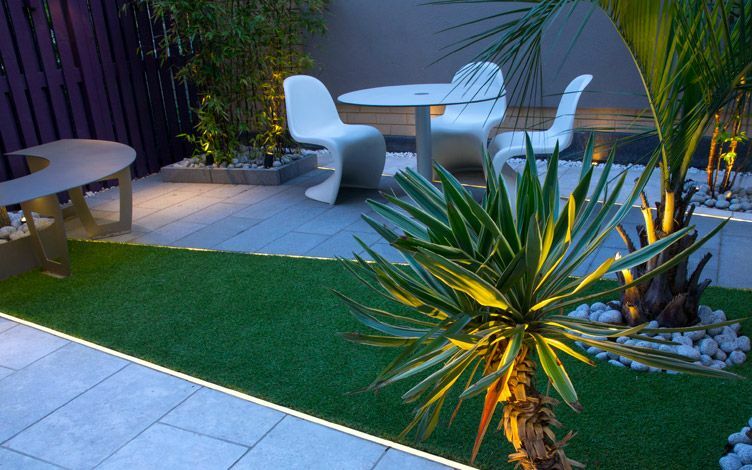 While our landscape design ideas were retrofitted around an existent garden framework, attached to a new home, its underlying ethos delineates great architectural integrity – forming a complete small city garden. 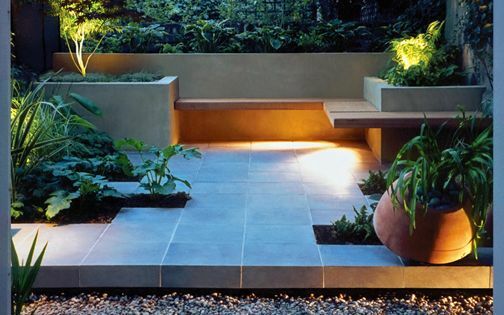 The garden surfaces alternate diagonally between flamed granite, honed limestone and artificial grass, creating distinct design detail among the seating and dining zones. 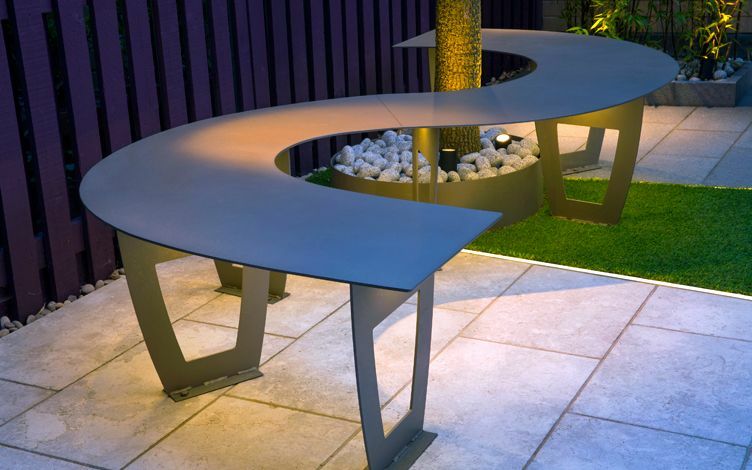 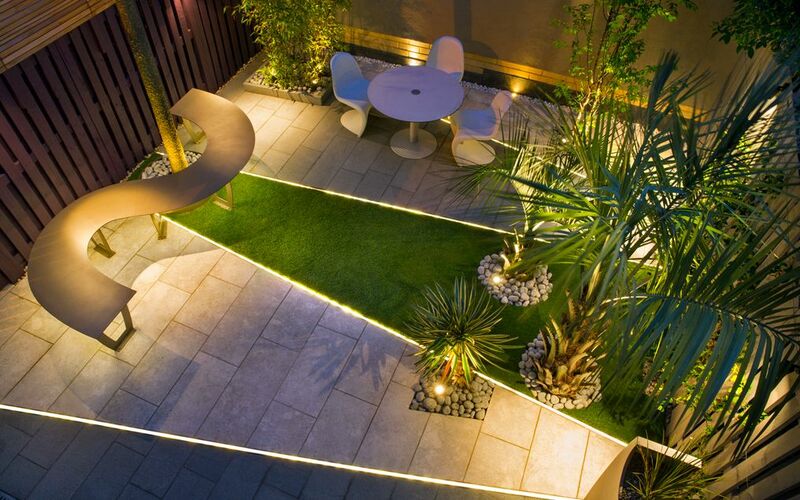 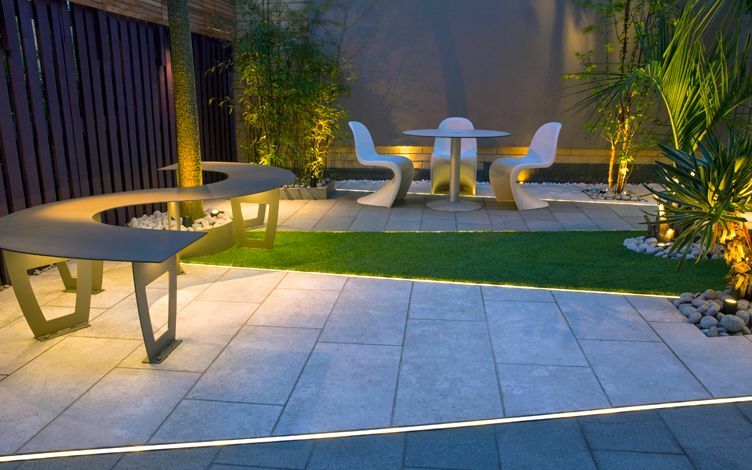 LED strip lights produce fresh definition at sundown, transforming the garden's ambience with an energising lighting design, amplified by a layer of down lights which projects architectural silhouettes through sculptural foliage. 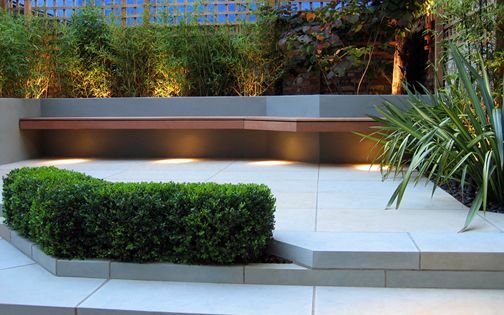 Existing fencing was coated in a deep mauve tint to invigorate the garden's left boundary, soaking up sunrays, contrasted with a subtle, creamy taupe across shaded elevations. 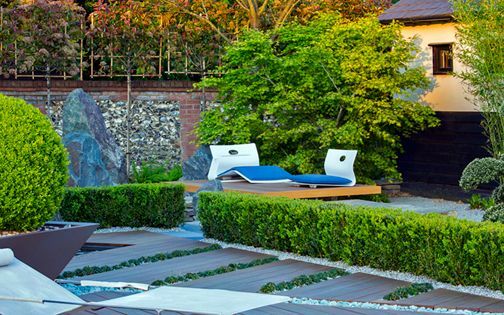 This visual asymmetry generates a greater sense of depth within a contemporary family garden in a compact space, thoroughly enabled by free-flowing reciprocation between our garden design team and easygoing, trusting clients. 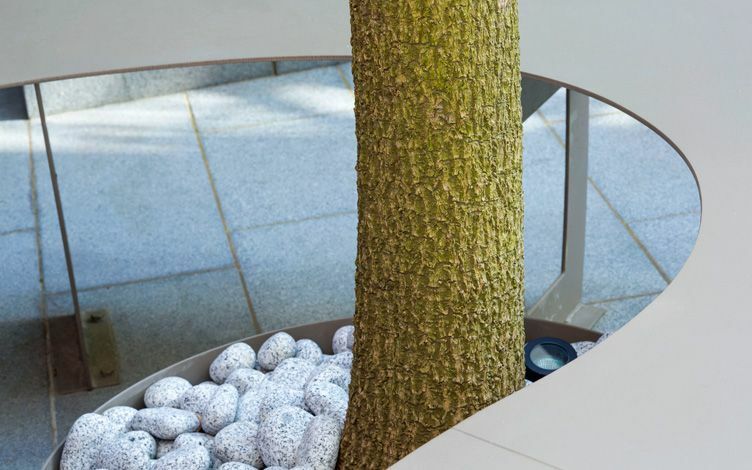 To contrast an asymmetrical garden design approach, we created a curvilinear bench to complement surface linearity, enveloping a tall Cordyline Palm tree trunk. 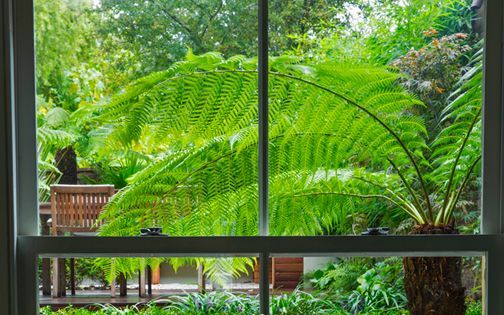 This offbeat perching spot benefits from afternoon sunlight, enhanced by views towards neighbouring verdant back gardens, amid a tropical garden backdrop narrated with arching lush foliage. 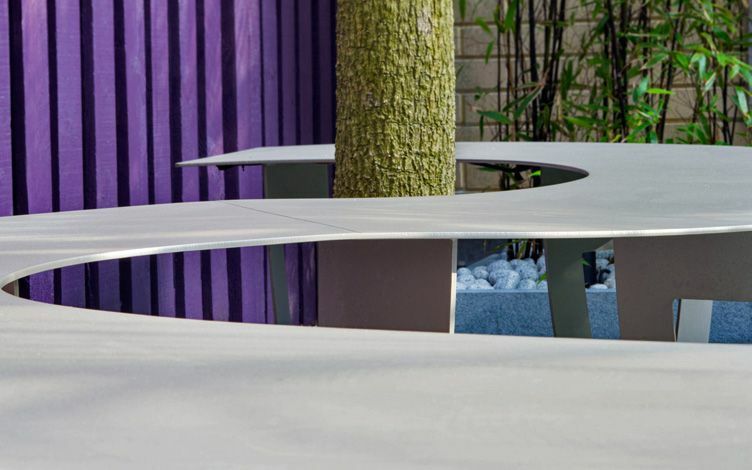 We further designed a bespoke pair of tall curved vases, positioned near a kitchen's window, to echo the seat's sinuous lines, and integrate a reciprocal, sculpted focal point. 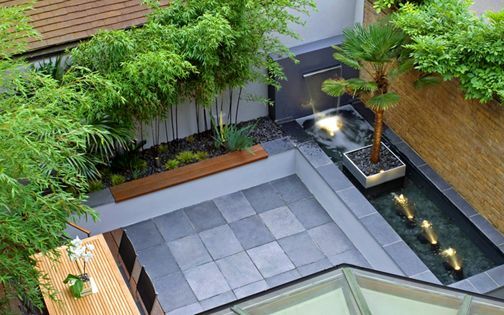 The garden design's contemporary articulation of shape, form and texture is appreciated from various mezzanine levels throughout this inspiring Highbury family residence, producing an invigorating, aerial perspective.